This year’s World Cup is only in its 10th match-day, but surprising and shocking results have already been plenty. With Spain and England officially eliminated after just two matches, Portugal getting thumped by Germany and Mexico holding host nation Brazil to a scoreless draw there were already many “oohs and aahs” heard in homes, pubs and Brazilian stadiums. But the biggest story thus far in this year’s tournaments must be the minnows from Costa Rica. 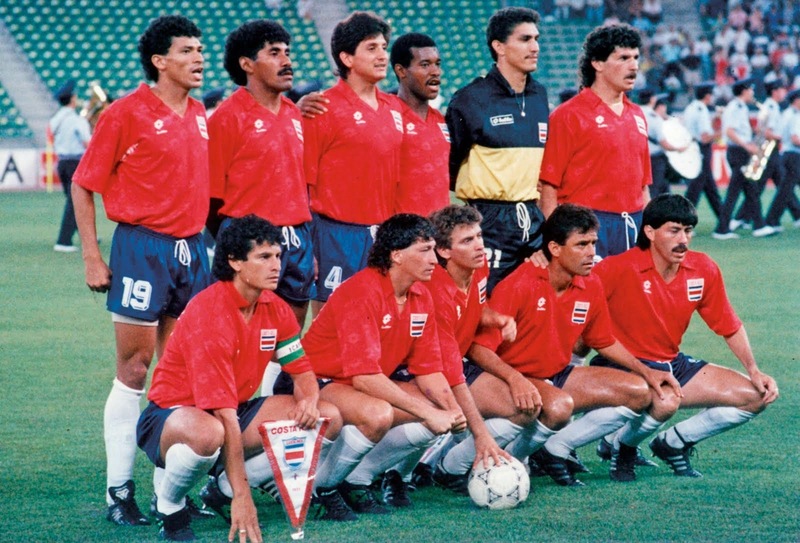 Prior to this tournament there weren't many who would pick the Ticos to surprise, especially after being drawn in a group with England, Italy and Uruguay. The Costa Rican squad looked to be the only outsiders in their group, with the other three being talked about as the real candidates for progression into the round of 16. But the heavy underdogs showed the world that the little guys can also perform on the big stage. The 2014 FIFA World Cup is Costa Rica’s fourth appearance in the big tournament. In 1990 the small Central American nation, coached by Yugoslav Bora Milutinović, qualified for the World Cup in Italy via the 1989 CONCACAF Championship tournament which also served as the qualifying for the World Cup. This would be their first appearance in a World Cup final tournament, but that did not stop the Ticos from putting together a great performance then as well. Drawn into a group with Sweden, Scotland and then three time champions Brazil, few (if any) people gave Costa Rica a chance to pick up any points in their group, in the same way they were overlooked this year. In their first match the new boys showed they did not travel all to way to Europe to just fold in front of the veteran nations, they won their first ever World Cup match 1-0 against Scotland. In their second match, Costa Rica faced Brazil. Only a goal from (then) Torino striker Müller would provide the Ticos with their first loss, a solid 1-0 performance from the small guys. In their final group match at the Stadio Luigi Ferraris in Genoa where they previously defeated Scotland, the Costa Ricans did the unthinkable against the Swedes. Sweden went 1-0 up from a goal by Johnny Ekström and were looking for one or two more, which would secure qualifying for the Scandinavians ahead of Costa Rica. But the underdogs came out in the second half with a plan. Two goals 13 minutes apart, one from Róger Flores and the other from Hernán Medford gave Costa Rica a famous second win in their first ever World Cup, and a trip to the round of 16 where they would meet Czechoslovakia. The Czechs were strong, and Costa Rica were eliminated from the 1990 tournament after a sound 4-1 defeat. The Ticos would not qualify to a World Cup event for another 12 years, missing out on the tourney in the US and France. Leading up to the 2002 World Cup in Korea / Japan however, the Ticos looked mighty in their qualifying campaign. With the likes of Rolando Fonseca, 1990 World Cup participant Hernán Medford and Manchester City striker Paulo Wanchope Costa Rica would qualify for the big tournament at first place in the CONCACAF qualifying group, losing just once from 10 matches (to USA), and picking up a famous 2-1 win against Mexico at the Estadio Azteca in the process. Again the Costa Ricans were drawn into a group with Brazil and although China was not a huge threat, the other team in Group C was a pretty strong Turkish side. The Costa Ricans again came out to a flying start, defeating the Chinese by a score of 2-0. After match two, a 1-1 draw against Turkey qualifying to the round of 16 seemed possible yet again. But on the third day of matches in their group the Costa Ricans saw everything go south. Although they managed to put two goals in the back of the Brazilian net, a 5-2 loss to the eventual tournament champions, combined with Turkey’s 3-0 victory over China meant the Costa Ricans would be eliminated in the first round by the virtue of goal differential. 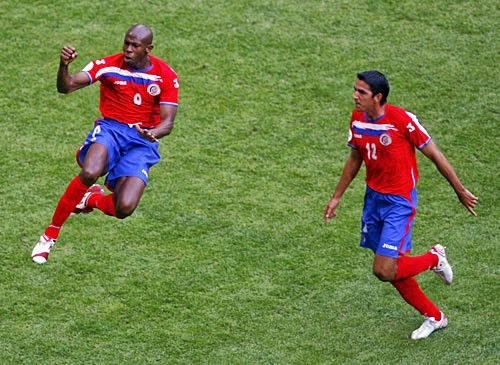 For the 2006 World Cup Costa Rica did not enjoy the same dominating qualifying success as they did earlier and were even close to elimination in a two-leg qualifying match against the Cubans in just the second round of four in the CONCACAF qualifying tournament. Costa Rica overcame their issues and scraped into the World Cup hosted in Germany in third place, behind Mexico and USA. For the big tournament the Costa Rican were drawn into a group with Poland, Ecuador and none other than host nation Germany. At this tournament success was not in the cards for the Ticos. Losing every match in their group, and with a goal differential of -6, the Central Americans crashed out of the 2006 World Cup without ever making even the slightest difference in this tournament. Leading up to this year's tournament the Costa Ricans looked pretty good in qualifying coming in second place behind the US, but ahead of Honduras and Mexico. Nonetheless, not many would have had a Costa Rican Cinderella story planned out in their heads going in to the 2014 World Cup in Brazil simply because of the group they were drawn into. But overlooking the small Central American nation was a huge mistake. With the likes of Bundesliga Mainz 05 midfielder / defender Júnior Díaz and Fulham striker (Costa Rican captain) Bryan Ruiz showing everyone that they did not come to Brazil to play second fiddle to the big boys in group D. With an impressive performance in their 3-1 opening match victory over the Uruguayans, the Ticos opened our eyes to a possibilty of a surprise. But when they followed up that win with another, this time against the Italians, the Costa Ricans put themselves very predominantly on the football "map", at least for the next year or so. With one match remaining against the already eliminated English squad, Costa Rica has already guarantedd themselves a spot in the round of 16 for just the second time in the nations history. And considering that they will get to match up against an opponent from the less than impressive group C, this could be the year the Costa Ricans place themselves on the list of most surprising performances in World Cup history.